The Liberal girls soccer team outlasted Wichita West 2-1 in sudden death overtime Monday in the opening round of the Wichita North Cup. 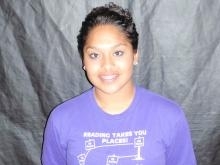 Junior Crystal Tiscareno scored both goals on six shots. Senior Nohemi Hernandez had eight saves to keep the Pioneers at bay. Liberal had 17 shots in the win. LHS improves to 4-8 and will play the Trinity Academy (9-2) at 5:30 Wednesday evening in the Wichita North Cup semifinals.